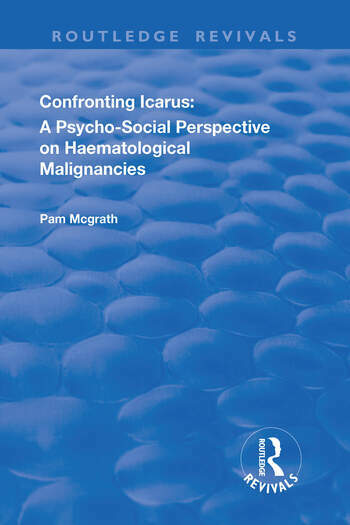 This title was first publihsed in 2000: Confronting Icarus, is the first book to bring together all of the original research that has been published to date on the psycho-social aspects of Haematological malignancies. This is a practical book to be used by health care practitioners and researchers interested in Haematological malignancies. Clearly written summaries of the findings from a wealth of original research are organised into ten distinct topic areas so that the reader can quickly and easily access an overview of the work completed in the area. For more detailed reference, each chapter includes, in chronological and alphabetical order, full descriptions of the relevant research. This book provides a constructive way forward to addressing the extensive literature that is concerned with the problems inherent in the biomedical perspective that presently predominates in oncology. A remedy, it is argued, is to build into our response to disease a sophisticated understanding of the human experience of illness through psycho-social research. Contents: Introduction; Research issues; The young years; Family matters; The treatment experience; Bone marrow transplantation; Post-traumatic stress; Sexuality; Survivors; Palliative care; Informed consent; Confronting Icarus; Postscript; Bibliography.